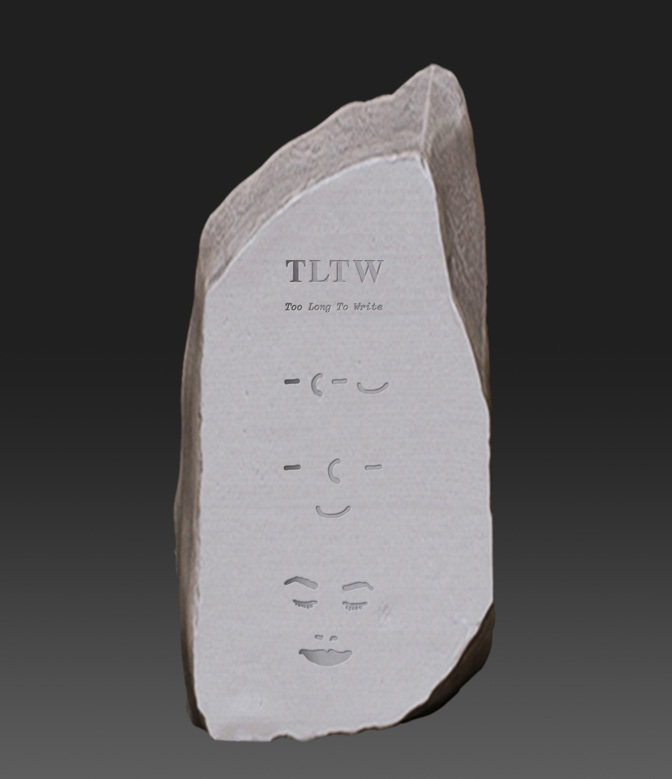 TLTRNW (Too Long To Read and Write) is a collection of sketches that explores abbreviation, compression and fragmentation in relation to how we consume and produce information and work in the digital age and beyond. It is a thought experiment into how we might communicate in the future, and further investigates how technology shapes those who in turn shape the form, meaning and the medium of the information. As such it explores the new breeds of languages if/when reading/writing becomes obsolete in a post-literate future. In contemplating about how our current reading/writing systems might be obsolete in the future, I started to think about existing obsolete writing systems in the present. I began thinking about the various forms of shorthand (Gregg, Pittman, Teeline in English) used by secretaries before being supplanted by dictation machine, a sound recording and playback device used for speech (the first one was invented in 1890’s). Although these forms are now obsolete, the notion of shorthand has been around for a very long time and is still very much alive. Shorthand or stenography, has occurred throughout history, from demotic writing which was a kind of shorthand to hieroglyphs that appeared on the Rosetta stone. Since the beginning of the Internet and various other forms of media such as mobile phones, language has also become abbreviated and condensed. So in short, internet slang, netspeak, texting, twittering and emoticons are essentially shorthands too. The technology or medium often shapes and influences this brevity, for example sms (short message service) was initially installed for technicians to check services at a cheap rate, and inadvertently became the most common way for everyone to communicate on the phone, influencing other media to place a similar character limit standard like Twitter, WhatsApp and Facebook Messenger.